To clarify, the subject of this week’s post is not the same as in this Penny Arcade strip. Rather, this post discusses the possibility of gigantic, monstrous birds developing in the future. For years, scientists have been fascinated and intrigued on how the pterosaurs, the premier flying animal group of the Mesozoic, achieved such colossal sizes, particularly the azdarchids. Azdarchids were massive pterosaurs, which grew to the size of giraffes and had wingspans of over 40 feet. For a long time the lifestyle of these animals was a mystery, until it was suggested by Darren Naish and Mark Witton that azdarchids were terrestrial stalkers, similar in lifestyle to ground hornbills today. Even more surprisingly, it has been suggested by several paleontologists, such as David Unwin, that the sizes of the azdarchids were not the upper limit of size that flying animals could achieve, and that wingspans of over sixty-six feet were possible! Now, how in the world could an animal the size of a giraffe get into the air and fly. There have been many suggestions, but it has recently been discovered that pterosaurs had air-sacs in their wings, reducing their overall weight and allowing them to become airborne, as can be seen in this Tetrapod Zoology post. 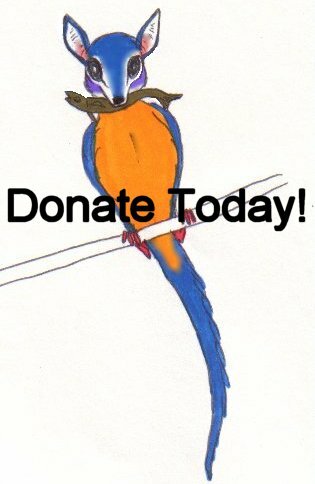 Birds also have their own equivalent of pterosaur air sacs, in the form of subcutaneous air sacs under the skin. In the aforementioned post, Darren Naish mentioned that several different types of birds today have these air sacs, including vultures, bustards, and pelicans. In addition to these, the most famous example of air sacs in birds can be seen in the screamers, bizarre quail-like birds from South America that are actually very primitive anseriforms (as in ducks and geese). The flesh of screamers is riddled with air sacs, which makes these birds rather unsavory to the people of the region. So what does this mean for birds in the future? Well, the largest flying bird today is the wandering albatross (Diomedea exulans) and there have been larger flying birds in the past (Argentavis, with a wingspan of over five meters). However, due to subcutaneous air sacs, birds could possibly get even bigger in the future. 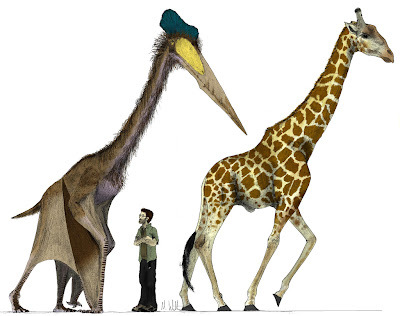 Perhaps in the future, we could see much larger birds, perhaps volant species the size of a human or one of the ornithocheiroid pterosaurs (like Pteranodon). I would be hesitant to say that future birds could get to azdarchid size, but you never know. However, there may be some problems with this idea. Some scientists suggest that the reason such large animals as the azdarchids could get airborne was the face that they walked on four legs, rather than two legs like modern birds. The additional strength of the extra limbs could help propel them into the air, and get them flying. Interestingly, bats today are quadrupedal, rather than bipedal, so if this theory is correct bats could achieve larger aerial sizes than they already have. Well, on my site I have gigantic bats. The Future Is Wild has Deathgleaners.